EXPOL is the largest manufacturer and distributor of polystyrene products in New Zealand. EXPOL are committed to protecting the natural environment and were concerned that waste material from manufacturing their polystyrene products was entering waterways via the stormdrains. Stormwater360 installed a LittaTrap™ as a trial unit in May 2016. The aim of the trial was to provide data on the effectiveness of the LittaTrap™ in capturing these small polystyrene particles and other gross pollutants. Polystyrene, is a petrochemical-based plastic that is harmful to the marine environment. Studies have shown that polystyrene begins to decompose within one year, releasing components that are detectable in the parts-per-million range. Those chemicals also decompose in the open water and inside marine life. 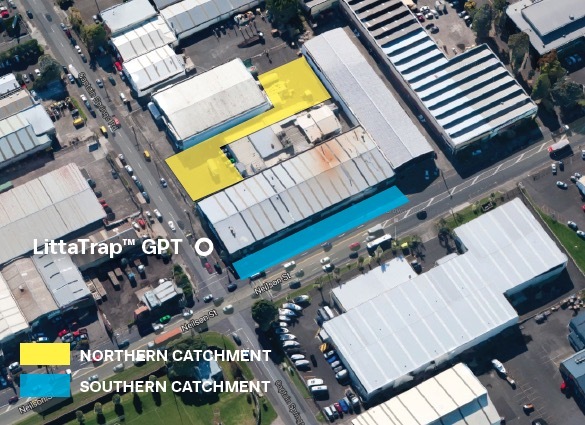 The catchment was estimated to be 8m X 27m to give a total of 216 m2 of industrial hardstand. The EXPOL sump was fitted with a 450 x 450 LittaTrap™ with a nurdle liner to capture the smallest particles >1mm in size. Introducing the liner resulted in a higher level (greater than 97%) removal of gross pollutants. The treatment unit was last maintained on 20th September, 2016. The gross pollutants collected in this clean represent 80 days of operation. We estimate based on the volume of polystyrene and organic material collected* from inside and around the LittaTrap™, the LittaTrap™ had a gross pollutant removal efficiency of 97% by volume. * This is based on material collected on the day of the clean.